Andra Good lived a pretty ordinary, happy life in Gilbert, Arizona until it was flipped upside down in 2010. Andra’s best friend Leigh Ann Tonkinson, who was her lifelong friend since high school, had been tragically killed in a car accident at age 35. Leigh and Andra’s families were both devastated and Andra knew she had to focus her grief into something positive. To deal with her sadness, Andra decided to take up sewing and taught herself how to sew through Youtube videos. Sewing would change her life forever in ways she could not imagine! “I just started sewing a ton of blankets and gave them to people. It felt good to create something and to put my eyes on giving to others and giving back,” Andra says. 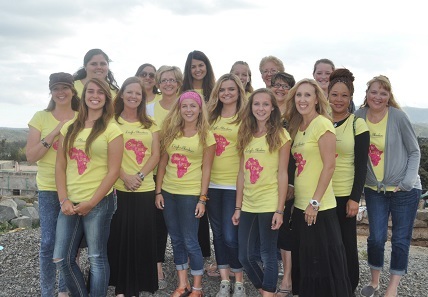 About nine months after Leigh passed away, Andra was at a Christmas service at church when she saw a slideshow of a mission trip to Malawi in southeast Africa. She got to thinking about how many blankies she was making and how they bring kids so much comfort. Plus, Leigh loved the blankets for kids. She had been a nurse supervisor at Phoenix Children’s Hospital and worked there for 10 years. As Andra watched the slides of these children in Africa. she just kept thinking I wonder if they would benefit from having a blanket of their own? Andra knew making blankies for a good cause could only be called one thing, Leigh’s Blankies, in the name of her inspiring friend. When I heard about the good work Andra was doing, I wanted to find out more about how she turned this fascinating passion of blankies for kids into a successful international non profit. In February 2011, Andra and a group of her volunteers sewed their first batch of blankies equaling up to about 16 blankets, which was nothing compared to what was to come in the future. 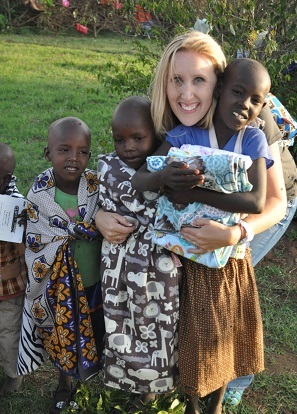 Andra sent these blankies to the same group in Malawi she had previously seen in the slide show in the church. These were the people who had inspired Leigh’s Blankies so Andra only saw it fitting that they were sent the first delivery. Andra received an excellent report back and was told that the children really loved having something to call their own. That prompted Andra and her team to start making blankies for kids in foster care as well because oftentimes they are removed from a home and don’t bring anything along with them. They also started making blankies for children overseas in orphanages and villages. In addition to sending blankies across the ocean, Andra set up programs that were more local as well. She partnered with Christian Family Care, an adoption agency in Arizona. 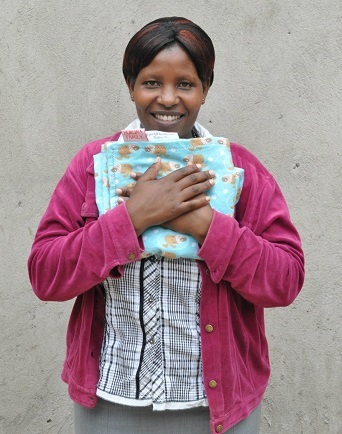 Andra now gives sets of blankies to this program, one tiny blankie for the birth mom and a normal blankie for the baby. This program is very important to Andra because she has personally adopted her two children. Andra uses blankies as a coping mechanism in various different ways for different people. 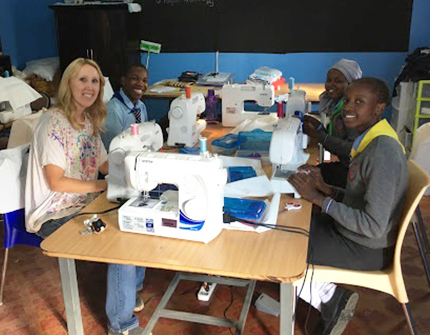 In addition to the making and distributing of blankets, Andra decided to take Leigh’s Blankies a step further and has created a sewing program at an orphanage at Huruma Children’s Home in Kenya where the children can make their own school uniforms. This home is also using the program to make money for the orphanage through different projects. “We didn’t really have any set backs and it seems like God just keeps on opening doors.” Andra says. Another project Andra and her team are working on is the Transition Housing Care Project. It allows children who age out of the Huruma orphanage to have support through a life skills class, a housing kit and the basic necessities they need to set up a small home. This project has been running for three years now and it has been really successful for the young adults. Through this program Andra and her team has found the majority of students that participate in the program go on to attend an African university. The biggest goal for Andra this year is to turn Leigh’s Blankies into Leigh’s Mission. She feels that changing the name to Mission would encompass all of the projects they are working on. Andra also would like to build a home, Mama Leigh Ann’s House in Kenya, that would house the children aging out of the orphanage. “If they were in a home together they could lean on each other, have accountability and it wouldn’t be such a hard transition going from living with 200 brothers and sisters at the orphanage to going out and living on their own,” Andra says. Andra could never imagined Leigh’s Blankies would take off and be as large and growing as it is today. It began as a small hobby rooted from grief and has sprouted into something truly great and meaningful. “Starting out in a project like this can be easy as long as you find something you’re passionate about,” says Andra. Her passion is truly inspiring and shows through all of her work and dedication to her program. “Oftentimes we have our own ideas and our own plans and they can get in the way. Sometimes we do things to better our own purpose and not to better the purpose of the organization that has already been doing the work,” Andra says as a word of caution. Her advice is to walk along with someone who has done something similar and make sure you ask them what would be helpful. Her blankies have been transported around the world. In addition to creating them for people in multiple villages in different countries in Africa, they can be found in India, Poland, Honduras and elsewhere. Since 2011 she has made over 6,000 blankies. I am inspired by Andra’s story and how she was able to make the most out of a devastating accident. In talking with Andra I could hear the kindness in her voice and the giving in her heart. I hope this story will open the eyes of others and spread kindness and hope. If you are interested in Andra’s organization, you can find more info at leighsblankies.com. Haley is a graduate from ASU’s Walter Cronkite School with a Bachelor in Journalism and Mass Communication degree. 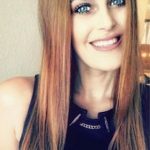 She is at the start of her journalism/public relations career and loves writing about people who are inspiring and making an impact in our world. Haley believes in giving back because she feels that we rise up by lifting others.